DNGR is a fictional band which also goes on adventures, solves mysteries, and saves the world (and the universe) from certain doom—in between touring the world and playing their music to sold-out stadiums full of fans. DNGR is composed of the three titular characters of The Death Noodle Glitterfairy Robot Saga: Death Noodle, whose parents are Death (think Grim Reaper) and a noodle, and who has the powers of both, Glitterfairy, a magical, glittery fairy, and Robot, a robot from another world. Robot is, of course, the band’s drummer. 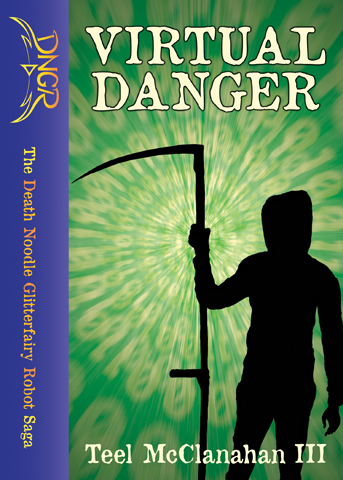 As of May 2013, there is only one book in The Death Noodle Glitterfairy Robot Saga: Virtual Danger, but for some strange reason it is not the first book of the series, but a middle one. It begins hot on the heels of one concluded adventure, and (as these sorts of series usually do) leads directly into another one; from the look of things, each book’s Epilogue is the next book’s Prologue. Teel McClanahan III is the author of the first DNGR book, but you could be the author of another; an earlier book, a sequel, or even a story from an alternate timeline. Virtual Danger is being released under a Creative Commons Attribution 3.0 Unported License, which means that you can do what you want with it, with the characters, the setting, the band, all of it, and the only restriction is that you credit Teel McClanahan III as the creator of the original. Copy the book, share it, re-publish it, translate it, give it away, or even sell it. Better yet, you’re encouraged to create derivative works: Write more books in the series, compose “cover” songs of DNGR’s music, figure out what the characters look like and draw or paint them, perform an interpretive dance dressed as a noodle, or anything else you can think of. Publish them, sell them, give them away; as long as you attribute Teel McClanahan III and Virtual Danger, it’s all fair game. Okay, so it’s just the one song, and a slight derivative of the original novel, so far… But if you’d like to have your name added to this list, just email teel@modernevil.com with a link to whatever DNGR-inspired thing you’ve created. If you’re a musician or author (or book reviewer!) who would prefer a complimentary copy of the Virtual Danger paperback (instead of the free eBook) you should also email me; I’m glad to send the book out into the world to try to expand the DNGR universe and extend The Death Noodle Glitterfairy Robot Saga. What I’d really love to see (in addition to the music I’ve already begun hearing) is more books in The Death Noodle Glitterfairy Robot Saga. I know a couple of authors who have given this some thought, but here’s the premise: DNGR (the band / team composed of Death Noodle, Glitterfairy, and Robot) goes on Scooby Doo or Jabberjaw (or insert YA adventure book series) type adventures (and misadventures), solving mysteries, saving the planet/universe/day, and touring the world as famous rock stars. Virtual Danger was written to read like an episode of one of those shows, but one in the middle of the run—I intentionally wrote a middle book of a series where no other books had yet been written, and heavily referenced many of their earlier (not yet written) adventures/books, then set the stage for several new ones down the road. Books I have little/no intention of writing. Books I’d love you to write. What happened during the Crystal Unicorn ordeal? How did Death Noodle overcome a harem of angry Yeti during the Ice Tzar Caper? Where did the Invading Hordes of Skeletal Skineaters come from? What’s Glitterfairy’s family like? (She has clurichaun cousins; who else is in her family tree?) The enemy in Virtual Danger is “Villain” and there’s mention of “Nemesis”; who else has DNGR faced off against? How the heck did Band Manager ever get to be DNGR’s band manager? I don’t know; you tell me! I’ll soon* make high-res (and web-badge-sized) copies of the DNGR logo available, for branding your own DNGR spin-offs, prequels, sequels, and songs. If you can think of anything else I’ve forgotten to mention, just ask. *If it’s after Summer 2013 and this message is still here, I missed “soon”—bug me about it.